In early Neolithic Vietnam, a young man survived from early adolescence into adulthood completely paralysed from the waist down and with very limited use of his upper body. Dependent on others for meeting his most basic needs, Burial 9’s survival was only possible because of the high quality, dedicated and time-consuming care he received. The skeletal remains of Man Bac Burial 9, shown in Figure 1 below, provide evidence of a pathological condition difficult to manage successfully in a modern medical environment. Four thousand years ago, the challenges to health maintenance and quality of life would have been overwhelming. Figure 1: Man Bac Burial 9 in situ. Looking after those who are unable to look after themselves is a behaviour that defines what it is to be human. Evidence suggests health-related care has been practiced within the human family at least the last 100,000 years, and some biologists claim that conspecific caregiving was essential to human evolution. Certainly, our response to the health needs of others embodies a wealth of information about ourselves and our community, reflecting cultural norms and values; collective knowledge, skills and experience; social and economic organisation; and, more prosaically, access to the resources which allow the support of someone experiencing disability. It follows that where healthcare practice can be identified in the archaeological record it has the potential to provide important - and possibly unique - insights into the lives of those under study. This is where the bioarchaeology of care comes in. ‘Bioarchaeology of care’ can be employed as an umbrella term to include any and all bioarchaeological research into health-related care provision. More narrowly defined, it's a term I appropriated in my PhD research to describe a specific methodology I’ve developed for identifying and interpreting evidence for health-related care (Tilley 2013). In what follows I’m going to describe this new approach. First, some background. In archaeology, the experience of pathology during life is expressed in human remains through lesions in bone or anomalies in preserved soft tissue. Health-related care provision is inferred from physical evidence that an individual survived with, or recovered from, a disease or injury likely to have resulted in serious disability. ‘Care’ is operationally defined as the provision of assistance to an individual experiencing pathology who would otherwise have been unlikely to survive to achieved age-of-death. ‘Disability’ refers to a state (temporary or longer-term) arising from an impairment in body function or structure that is associated with activity limitations and/or participation restrictions, and given meaning in relation to the lifeways in which it is experienced. What healthcare comprised depended on the nature of disability, context in which it occurred and care recipient characteristics. For bioarchaeology of care research purposes, this care may be divided into ‘direct support’ (e.g. provisioning, nursing, physical therapy) or ‘accommodation’ of difference (e.g. strategies that enable a level of participation in social and/or economic activity). Care may begin as ‘support’ and convert to ‘accommodation’ as an individual recovers (but is left with some disability) - or vice versa. There are obvious provisos. Care can only be inferred with reference to what is known about the contemporary social, cultural, economic and physical environments. What constitutes health, disease and disability is understood very differently in different cultures; the bioarchaeology of care can only postulate disability where there is evidence of significant physical impairment. Furthermore, everybody experiences disease in their own way - disability for one person may not be a disability (or not the same disability) for another. Assumption of the need for care – as well as the conclusion that care was provided - must always err on the side of caution. Finally, the bioarchaeology of care approach can only be employed at a case-study level - at least when dealing with skeletal remains (the focus of the rest of this article). Most pathologies won’t ever manifest in bone, and this means that in any prehistoric community the extent of past burden of disease - and consequently frequency of caregiving in response to this - must remain unknown. 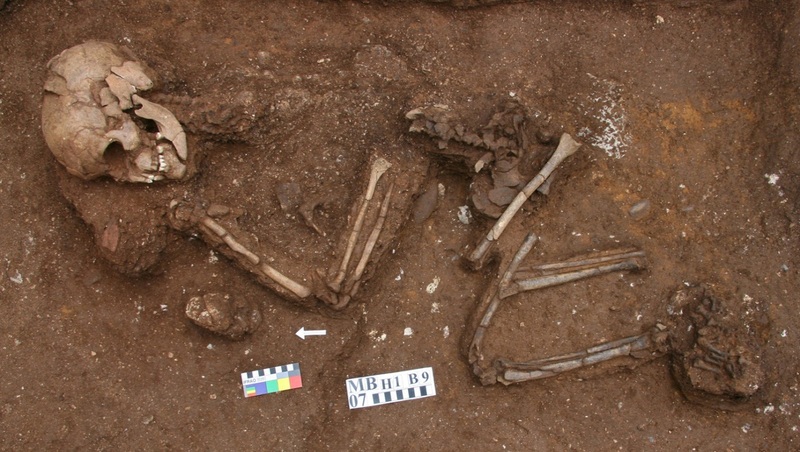 Interrogating the evidence for caregiving: the bioarchaeology of care methodology. The bioarchaeology of care methodology comprises four distinct stages of analysis, each building upon the observations and conclusions of the previous one. Although unplanned, these stages parallel those of Christopher Hawke’s famous ‘Ladder of Inference’ - the first stage concentrating on description and measurement, and the last wholly dedicated to interpretation. All stages of the bioarchaeology of care necessarily derive from the set of human remains displaying evidence of disability. These remains possess the dual identity of ‘actor’ and ‘artefact’; actor, because the skeletal elements represent a once-living person who faced the challenges of disability, and artefact because the skeletal indicators of disability only exist by virtue of the care that helped this person to survive long enough for the pathology to register in bone. This reading of the bones as simultaneously signifying individual (subject), and invention (object), underpins the analysis of care in prehistory. Stage 1 is triggered by human remains showing evidence of living with, or following, a serious pathology. It records every aspect of the remains, their recovery context, and details of contemporary lifeways. Indicators of pathology are described, and diagnosis is attempted. If specific diagnosis is impossible, lesion characteristics may still provide clues to disease impact. The information recorded at Step 1 is the foundation for all subsequent analyses. Stage 2 considers the likely clinical and functional impacts of the pathology on the subject. Modern clinical sources are used to assess likely clinical impacts. Human biology has remained the same over millennia, allowing extrapolation from current knowledge of disease symptoms and complications. Tuberculosis or a compound limb fracture elicited the same basic physiological responses in the past as they do in the present. Estimating functional impact looks at the likely demands, obstacles and opportunities in the contemporary lifeways environment, and evaluates the probable effects of pathology symptoms on the subject's ability to undertake tasks of daily living, or to participate in their community, without assistance. The goal of the second stage is to establish whether, on balance of probability, the individual experienced a disability requiring either ‘direct support’ or ‘accommodation’ in order to survive. If the answer is yes, then we infer care. Stage 3 identifies what - in broad terms - this care likely comprised. The goal is to produce a ‘model of care’ within the parameters of the possible and the probable given the contemporary context. This model also considers how many people may have been involved in caregiving (in small groups care likely involved most members, to compensate for increased resource demands and/or reduced economic contribution of caregivers) and duration of care-provision. The fine details of care will always be inaccessible. For example, in any particular case we can't know whether herbal remedies were used, or whether caregiving required prayers, spells, or exorcism. But basic practices don’t change. Haemorrhages must be staunched; bedridden individuals kept well-nourished, clean, comfortable, and regularly repositioned to aid circulation and prevent pressure sores; people with high fever kept hydrated. Often the more practical components of treatment can be deduced with some confidence from knowledge of the likely clinical and functional impacts of disease. 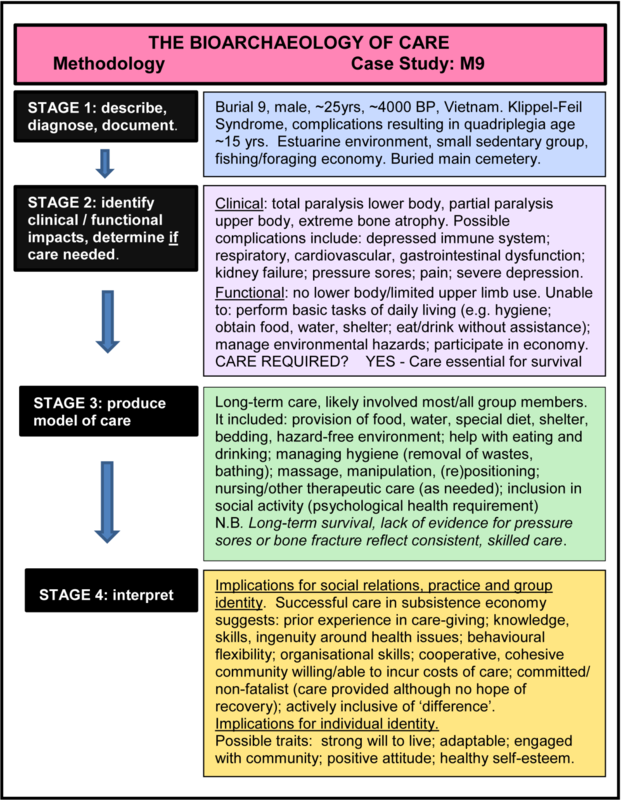 Stage 4 unpacks and interprets the model of care developed over the first three stages. It explores what the constituent elements - singly or in combination - suggest both about contemporary social practice and social relations and about group and individual (care-recipient) identity. While each case of care is unique, there is a fundamental principle to be observed in all cases of health-related care: recognition that care is the product of agency. Caregiving is an intentional, goal-directed response to a perceived health crisis, and often consists of complex, inter-related, continuously-refined and negotiated behaviours carried out over time. The decisions reached in relation to giving and receiving care hold the key to interpretation, and Stage 4 focuses on the likely choices made (and aspects of identity underlying these) that contributed to achieving the care outcomes observed in the skeletal remains under study. In relation to caregiving, questions might consider, for example, what options were likely available for caring, which appear to have been adopted, and why; comparison of the potential costs and benefits of choices available and those selected; what the ability to provide care suggests about group organisation, practice and history; and what the decision to give care, as well as the type and extent of care given, suggest about general norms and values of the group. In relation to receipt of care, a picture is drawn of what, within that lifeways context, the likely ‘normal’ role of someone from the same demographic as the care-recipient may have been. What was the likely impact of disability on the care-recipient’s ability to fulfil this role? What alternative roles were available? What sort of personality characteristics might have been needed to manage pathology-imposed limitations - and what sort of personality might have inspired others to support or accommodate this particular individual’s needs, possibly in difficult circumstances? Attempting to identify characteristics of a person known only through their bones is speculation, but it’s speculation based on a solid platform of reasoning. There is little as intimate as the experience of disability. We can never know with certainty how a prehistoric individual coped, but in cases of extreme disability we might be able to infer some broad character traits and behavioural strategies that were called upon. Figure 2 illustrates the bioarchaeology of care methodology in action, using the example of the young man from Neolithic Vietnam introduced earlier. Although abbreviated, it gives some idea of the information available from the remains of someone who lived with disability (see Tilley and Oxenham  for detail). Figure 2: The four stages of the bioarchaeology of care methodology applied to the case of Man Bac Burial 9. What next - and why? In the bioarchaeological literature there are many cases of survival with disability. For example, the Neandertal Shanidar 1 survived cranial trauma, amputation of the right arm, various other injuries, and osteomyelitis (Solecki 1971; Trinkaus and Zimmerman 1982) - suggesting ‘support’ during acute injury and ‘accommodation’ afterwards. Born with a mesomelic form of dwarfism, Romito 2 survived in mountainous, Mesolithic Calabria (Frayer et al. 1987); his remains display upper and lower limb abnormalities rendering ‘normal’ male hunter-gatherer activity impossible - suggesting ‘accommodation’. In the early Italian Neolithic a woman survived for years with the increasingly savage effects of tuberculosis (Canci et al. 1996), impacts of which include pulmonary haemorrhage, respiratory infection, fever, pain and finally, in this instance, spinal disintegration resulting in reduction or loss of lower body mobility - suggesting initial ‘accommodation’ followed by ‘support’. In some studies the likelihood of care is acknowledged, although not elaborated. But in most it’s ignored, and valuable information is lost. Wherever evidence in human remains meets the criteria for inferring care, there is a role for a bioarchaeology of care analysis. Our knowledge of what happened in prehistory will always be partial. When we focus on issues such as care, that are intrinsically emotive, value-laden, and ultimately reliant on interpretation, it will also be contentious. However, the bioarchaeology of care methodology provides a structured, systematic and transparent framework for analysis, enabling inference and interpretation to be scrutinised, challenged and - where appropriate - changed. Equally importantly, a bioarchaeology of care focus opens the way to a level of engagement with prehistory that helps us to meet our responsibilities, as archaeologists, to (re)produce the past in a way that captures the complexity, the sophistication and the humanity of those who have gone before. In this case, the focus on caregiving in the past also provides a new perspective for looking at the meaning and practice of this behaviour in the present. Canci, A., Minozzi, S. and Tarli, S.M.B. 1996 New evidence of tuberculosis spondylitis from Neolithic Liguria (Italy). International Journal of Osteoarchaeology 6:497-501. Frayer, D.W., Horton, W.A., Macchiarelli, R. and Mussi, M. 1987 Dwarfism in an adolescent from the Italian late Upper Palaeolithic. Nature 330:60-62. Solecki, R.S. 1971 Shanidar: the first flower people. New York: Alfred A Knopf. Tilley, L. 2013 Towards a bioarchaeology of care: a contextualised approach for identifying and interpreting health-related care in prehistory. PhD Thesis Australian National University. Tilley, L. and Oxenham, M.F. 2011 Survival against the odds: modeling the social implications of care provision to seriously disabled individuals. International Journal of Paleopathology 1:35-42. Trinkaus, E. and Zimmerman, M.R. 1982 Trauma among the Shanidar Neandertals. American Journal of Physical Anthropology, 57:61-76. © copyright (2012) Society for American Archaeology. Reprinted by permission from The SAA Archaeological Record, Vol. 12 (3). This article first appeared entitled ‘The Bioarchaeology of Care’ in The SAA Archaeological Record theme issue ‘New Directions in Bioarchaeology’. Some minor changes have been made to the original text, and Figure 1 was not included in the original article in accordance with the journal’s editorial policy.